Fold forming was invented by Mr. Charles Lewton-Brain in the 1980's and is considered by the British Museum Laboratories to be a new way to work metal by hand. The first in thousands of years. This class will focus on the basic fold-forming concept of working sheet metal by folding, working, and unfolding and its application to hot iron. 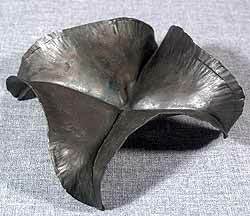 We will work on a few basic folds and the tools and techniques necessary for fold-forming in hot metal, and advance as time and abilities allow. There is Open Smithy time scheduled after the class for those that wish to stay and keep working on their pieces. Students should have attended Fold-Forming I at PHF or one of Mr. Lewton-Brain's fold-forming seminars here or at Metalwerx. Gift Certificates for Fold-Forming II: Fold-Forming for Blacksmiths are available. If you're interested in taking Fold-Forming II: Fold-Forming for Blacksmiths and it's not on the calendar, please tell us using our Waiting-List Page.